If yes, then tell us about it. The fight against Corruption may well begin with simple acts of documentation. For too long we have shied away from disclosing this very personal pain that most of us have to endure. Occasionally people pay a bribe to get something done out of turn or to get things hastened up . The blame in those cases is shared squarely between the one paying bribe and the one receiving it. But in most other cases, one is forced to pay a bribe because there is no other alternative but to forgo the requested service. All we then do is to pay silently and forget about it. But now there is way to get back – by creating a ‘virtual record’ of the the acts of bribe. The Bribe Rate Chart is an initiative to use our collective strength[ recall: Why Social Media can fight Corruption – Aggregation] to send a definitive signal to our ruling elite that Corruption is a problem that has to be dealt with expeditiously. The promise is now live in the form of a Bribe Rate Chart. This is a page to be built by the contributory knowledge of all you. You can directly add to the limited information provided on this page from the wealth your own personal experience or your private sources of information. Your inputs will shape this page. If however you find it difficult to add the information directly you may send us the information in either of the below three ways. We will then include the same in the ‘Bribe Rate Chart‘. 2. Tweet about what you want to add with #NoBribe hash tag. 3. Leave a comment at the bottom of the ‘Bribe Rate Chart’ post. report corruption, tips, which will be forwarded to world community and authorities. Reference: Airtel policy is to make customers pay for seeking support for a service that they have already paid for. Once i need income certificate (iam not submitted) i bribed 50/- to attender he went inside and signed there & he has the stamp he marked and gave it to me. Corruption has grown rampant, these politicians are so busy in filling their pockets they don’t have a movement to stop and think that if they eat up our country like termites the day is not far where nothing will be left in the country. Corruption will one day reach its saturation point and just the thought of it scares me, There will no law and order left, whatever little trust or hope we have in politicians will be completely lost, as a byproduct of corruption Naxalites will pop up everywhere in the country and win the trust of citizens who would have lost hope in politicians and then imagine every day there will be blasts, shout outs and violence, Why are we heading towards this terrible future is this what we want to give out kids, why should we and our kids suffer because of these corrupt politicians and above it common man is made so helpless that he cannot get a single work done without paying corruption and then these smart politicians blame us saying we promote corruption, how shameless. Enough is enough time has come when we all stand together and start a movement against corruption, decades ago Mahatma Gandhi had started struggle to give us independent country and now after 63 years it is time we start a new struggle to give out kids corruption free country for their bright and peaceful future. Rather than keeping quiet and turning blind eye to what is going on around us, Do your bit by protesting against corruption in whatever form you can, tell your friends and family about politicians who are caught in corruption charges and persuade every one not to support them and express their rage against them in whatever form they can as I am doing my bit by writing this article. To fight corruption, First it should start from all government employees. We all should know the rules and regulation of the government department. If we know the same, no need give bribe for our work. 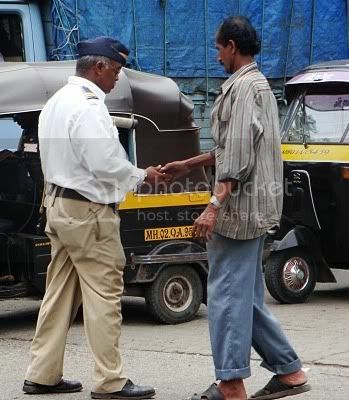 In some case inspite of following all the rules and regulation, they are taking the bribe. I like to bring to all your notice, that recent I have visit to Labour Department of Karnataka. To file our annual return form U. I have paid Rs. 200 just to take acknowledgment from the officer. Usually the officer who take the form should acknowledge the receipt of the same after verification. They have made arrangement in such a way, that officer just verify and sign the form, to take seal on the same he instructed to take it from clerk. The clerk demanded Rs. 200/- for affixing the seal on it. The return filled is not valid without seal. I have paid bribe in police station when i went to make my passport all though i was clear from my side. Then also he took money form me.